The Bismarkia Palm is Bismarckia nobilis, a dramatic landscape feature palm tree originally from Madagascar. Growing well in drier areas, they are used extensively in landscaping around the world. 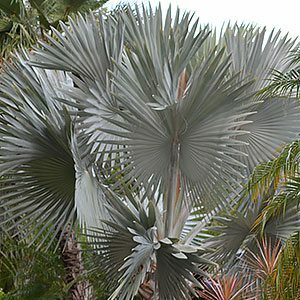 Grown for the attractive silvery blue foliage which is fan shaped and help fairly erect Bismarkia palms are best planted in an open position where they can be appreciated. Bismarkia palms are commonly known as the Bismark Palm and are suitable for tropical and sub tropical areas of Australia. It is possible to prune the Bismarkia Palm so they grow with a clear trunk..
Evergreen / Deciduous – This is an evergreen tree. Width – Will form a crown of 8 – 10m on maturity, growing from a single trunk, with a single frond or ‘fan’ being up to 3m across. Habit – Upright single trunk. With a large spreading grown they are a palm tree best suited to areas where they have a little space. They need good sun and warmth to look at their best. Excellent as a feature tree in a park or garden and also suited to street planting or as a background tree in resorts and around swimming pools. Easy to grow once established, and very drought resistant as well. The wonderful blue to grey colour of the fronds is a rarity amongst palm trees and is an attraction. Very attractive fan like fronds, and it will flower with white fragrant flowers. It is a large growing palm and a mature specimen makes a good feature tree in the garden. Bismarckia nobilis look fantastic when planted as a specimen or in a street avenue situation. Two forms are available, the popular silver grey foliage form and a green foliage form. Bismarckia nobilis are available for sale from the following wholesale nurseries.